I am not sure if anyone is actually reading these recaps. Well, I will be doing them still, even for a handful of users. I was given an opportunity to write on this blog and I ain't gonna just throw it away when blog is having it's bad days. And besides, I love writing too much just to give up. Still reading? Well, my recap goes now. On Monday, we got new collection in Museum Mile store. The collection is, surprisingly and thankfully not limited. It is designed to portray fashion trends in last 100 years. You now have an option to see the glimpse of vintage fashion that was popular in days. We got some interior too, paintings mostly. I am loving few of the pieces, but I am honestly not such a fan of vintage fashion. The same day, Stardoll announced HotBuys for the following month - June. Items seem to be kinda boho style, with some modern items, such as that leather jacket or black swimsuit. Not the best, but not the worst HotBuys. I'd prefer some 'regular' items instead. On Wednesday, we got a fantastic new collection of Polished. After all but one floor of Sprinkled leaving, my guess was Stardoll wouldn't bother with designing nailpolishes and accessories for our virtual dolls, but I was wrong. The prints look lovely on bottles, not so good on nails though. Prices are ok, for 10sd you can get a nice, spring themed manicure. And even I don't do my virtual nails often, I may grab some. 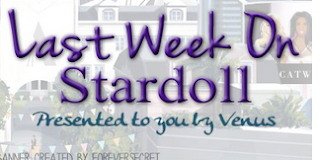 On Thursday, Stardoll announced a 50% off closing sale on selected floors of Royalty store. The first few floors are on sale and leaving plaza soon, so we can probably expect new collection soon. Before that, if you are royalty member, you might wanna grab your favorite pieces before they are gone. I did that, a ling ago before the sale, but I still might buy a thing or 2. And on Friday, one 'ordinary' release - new Bonjour Bizou collection. Yeah, that's all for the week, hope you had a fun one. So vote, comment (of course you will, silly me), and see you next week.